In these days of uncertain fuel prices, the prospect of energy saving and living off-grid is an attractive one. My mother’s house in Cornworthy, South Devon had an inefficient oil boiler for many years, the only option in a village with no mains gas. 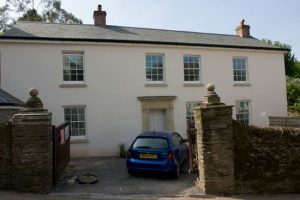 As part of an epic two-and-a-half year refurbishment – one that has seen the house taken back to the original stone structure, externally insulated, a new roof added, extended and refurbished to a high standard – a ground source heat pump has also been installed – you can see pictures below of the house and the pump. The pump, supplied by Nu-Heat provides the house’s space heating and hot water requirements. Three bore holes were drilled into the front garden, linked by a flow and return to a 12 KW ground source heat pump, something which looks not unlike an oversized washing machine. From here water up to 60 degrees Celsius is pumped to the bathrooms and the under floor heating system. The principal of extracting heat from the soil is basically the reverse of a fridge extracting heat from a unit; for every unit of electrical energy used to drive the pump, 3-4 units of solar radiation is taken out of the soil. This will work all year round and even in sub-zero temperatures. At a cost of £4500 for the bore holes and £9000 for the pump and tank, it is more expensive than a standard boiler installation, but with increasing gas/oil prices the pay back times are reducing all the time. There is also something incredibly satisfying about using green energy, albeit with minimal electrical bills, to heat your home. We intend to monitor the energy use and the success of the installation for months and years to come. 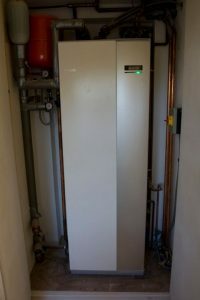 You can find our more about the heat pump we used by clicking here.